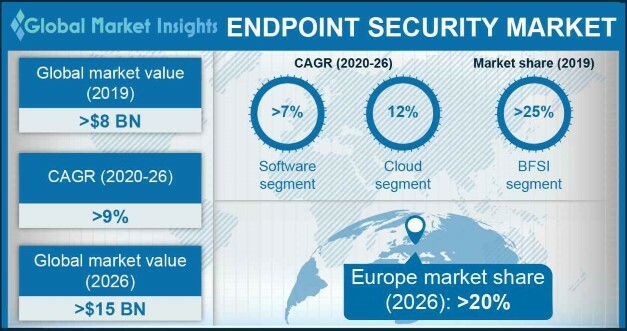 Endpoint Security Market size is set to exceed USD 7.5 billion by 2024; according to a new research report by Global Market Insights, Inc. The endpoint security market growth is attributed to the rise in the incidents of massive cyber-attacks on government and private IT networks around the world, potentially threatening national security and the privacy of critical public information. Due to frequent cyber-attacks, such as Shadow Brokers, WannaCry, and Petya, government and private organizations are increasingly deploying security solutions to protect their IT infrastructure. Also, with the growing popularity of the BYOD among enterprises around the world, the need to secure different types of mobile devices used in enterprise networks is leading to the rapid deployment of antivirus/antimalware solutions by organizations worldwide. The software segment held a market share of over 80% in 2016 due to the large-scale deployment of protection solutions such as intrusion prevention systems, antivirus systems, and endpoint application control systems by enterprises to prevent malicious threats from infecting enterprise networks. The service market is expected to exhibit a promising growth over the forecast timeline as associated services ensure timely updates and maintenance to enable the protection from constantly evolving threats. The cloud segment is expected to register an accelerated growth over the forecast timeline due to the rapid adoption of cloud computing technology by enterprises and government institutions to enable flexible and highly scalable deployment of cyber security solutions over cloud platforms. As cloud-based solutions offer the latest updated versions of cyber security product instances, their adoption is expected to increase significantly between 2017 and 2024. The BFSI endpoint protection market will exhibit high growth over the forecast timeline owing to stringent government regulations around the world demanding the highest level of security for customers’ financial records stored and retrieved through the IT networks of financial institutions. As such networks are the prime targets of hackers for ransomware attacks, the demand for advanced and robust malware protection solutions from the BFSI sector is expected to increase rapidly over the forecast period. North America will hold the majority share in the endpoint security market by 2024 due to favorable government initiatives to adopt effective security solutions to mitigate the threats arising out of frequent cyber-attacks on public as well as private IT networks in the U.S. Asia Pacific will grow at the fastest rate due to the rapid modernization of IT infrastructure in India, Singapore, and South Korea. Also, the increasing adoption of endpoint protection technology for strengthening the national defense IT and communication infrastructure in these countries is expected to contribute largely to the market growth. The companies operating in the endpoint security market are consistently involved in product development and innovation to offer advanced endpoint protection capabilities to their customers. For instance, in October 2017, McAfee announced the launch of McAfee Investigator that uses both AI and machine learning and automates data collection to increase the accuracy of the investigations. The key players operating in the endpoint protection market are Cisco, Bitdefender, Ahnlab, Sophos, F-Secure, McAfee, ESET Microsoft, IBM Symantec, VIPRE, Trend Micro, Webroot, Kaspersky Lab, Comodo, and Panda Security.